Invasive species are bad news. They compete with native critters for food, destroy local ecology and, in some cases, are even dangerous to humans. And thanks to the increasingly global nature of our world, there are more and more animals discovered where they don’t belong every year. Here are just a few pests that have hitched rides to distant shores, where they’re currently wreaking havoc. The cane toad (top) is perhaps the most infamous invasive species. Native to Central and South America, it has been imported to a number of places—Florida, the Phillippines, some Japanese islands, most islands in the Caribbean, and Hawaii, among other places—by farmers who hoped the creatures would wipe out local pests. Instead, they got another kind of pest, one that’s much harder to get rid of. The cane toad is huge—the biggest, captured in 2007, was over 8 inches long and weighed nearly two pounds—and voracious, gobbling up many native species. 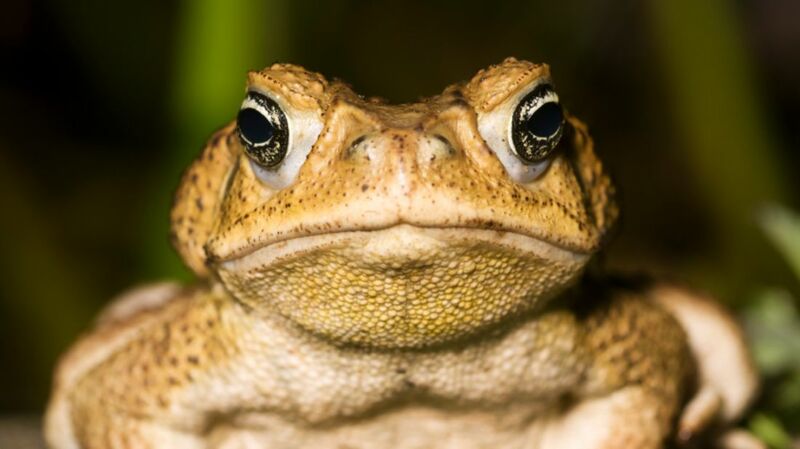 The toxins in the cane toad's skin often kill animals that try to eat it (except for those animals who seem to deliberately get high by licking the toads), and it puts rabbits to shame with its reproductive capabilities; each female lays thousands of eggs each year. Case in point: Australia. In 1935, 102 cane toads were introduced to combat the Greyback Cane beetle. By 2010, that number had ballooned to 1.5 billion toads spread over 386,100 square miles, and they show no signs of stopping. The toads are hardy, too: they’ve been spotted coming out of brush fires or hopping away after being run over. One toad even survived being eaten by a dog, which threw up the perfectly-fine toad 40 minutes later. You’ll recognize this nasty bug, number four on the list of 100 worst invasive species, by the black and white markings on its body and legs. Native to Asia, it has spread to Europe, Africa, the Middle East and the United States—first in Hawaii in the 1800s, and then the continental U.S. in 1985, when it hitched a ride from Japan in a shipment of tires. Unlike most other mosquito species, the highly-adaptable Asian Tiger is active during the day, and lays its eggs either near stagnant water or in fresh running water. To nourish her eggs, the female feeds off of humans, birds and other animals with a rapid bite that allows her to eat and fly before she can be swatted. The mosquito is a carrier of West Nile virus and dengue fever, among other diseases dangerous to people. Scientists in South America are experimenting with genetically modified versions of the males—which, when released into the wild, live just long enough to mate and pass on a lab-tweaked gene that kills the larvae shortly after they hatch—though the plan to introduce those modified bugs in Key West has been met with some protest. Burmese pythons, native to Southeast Asia, came to the United States in the 1990s as part of the international pet trade. When those pets escaped their enclosures or were released into the wild, they bred, and the first established populations were reported in 2000. These massive snakes, which grow to an average of 12 feet (although larger ones have been found, and the snakes can grow to 20 feet in captivity), are eating their way through native species throughout Florida. Scientists believe they could eat Florida panthers, and at least one has tried to eat an alligator (albeit unsuccessfully: the snake exploded). It’s now illegal to import the snakes into the U.S. without a permit. If you live in certain portions of the United States, you might notice ugly, shield-like insects crawling and buzzing around your house. Squish or swat at them, and you’ll to get a noseful of foul stench. These obnoxious little pests are brown marmorated stink bugs. Native to Eastern Asia, they were first discovered in Allentown, Pennsylvania, in 1998, but likely arrived in shipping crates a few years before that. Since then, the bugs have spread to 34 states in the Northeastern U.S., the mid-Atlantic region and the Pacific Northwest. Halyomorpha halys eats almost anything it can get its proboscis on including apples, pears, soybeans, green beans, raspberries and cherries. And they’re destructive: In 2010, 18 percent of the mid-Atlantic apple crop was destroyed by the bugs. Brown marmorated stink bugs have few natural predators here, but scientists are exploring releasing non-stinging parasitoid wasps to help keep the stinkers in check. Researchers have also figured out where bugs that don’t come into your house spend the winter, which they hope will help control the population. How do you get them out of your house? Bide your time. When it warms up, these stink bugs leave on their own. And, thankfully, they don’t lay eggs or nest in your walls—all of that behavior happens outside. The National Invasive Species Information Center lists four different species of Asian carp that have made their way into U.S. waters from Eurasia, where they compete with native species for food. One species, the silver carp, can also be dangerous to humans: The fish, which can grow to 100 pounds, are easily frightened by boats and frequently jump out of the water—sometimes onto people. According to a 2007 EPA report, “injuries include cuts from fins, black eyes, broken bones, back injuries, and concussions.” Some species have spread across the U.S.; it’s now illegal to import them without a permit. These clumsy fliers, native to Japan, probably came to the U.S. in a shipment of iris bulbs before 1912, when commodities inspections began. They were discovered in a Riverton, New Jersey, nursery in 1916 and have since spread as far as Idaho. The Japanese Beetle munches on 200 types of plants, including birch trees, rose bushes, grapes, and hops, consuming the leafy material between the veins. The Zebra Mussel, native to Eurasia, came to North America in ship ballast water. They were first detected in the Great Lakes in 1988, and have spread like crazy since then. These tiny pests—which range from about the size of a fingernail to 2 inches in length—compete with native species for food, but they’re a headache for humans, too: They clog pipes and attach themselves to locks and dams. Dealing with the creatures costs millions of dollars a year. If there’s one thing you don’t want to do, it’s accidentally stumble on a fire ant mound: These insects, native to South America, will swarm up your leg and sting in concert. Their venom, which contains a necrotizing alkaloid, isn’t typically strong enough to kill a person, but those stings hurt—a lot. The fire ant was introduced to the United States in the 1930s when it hitched a ride in ships’ ballast and has become a pest across the south. (There are also invasive populations in Taiwan and Australia.) Because they’re aggressive and extremely resilient—fire ants can survive both floods (by balling up into an ant raft) and droughts—they’re wiping out many native ants and lizard species; their mounds also destroy plant roots. Stopping the invasion might seem impossible, but another non-native species might be able to help. In 1999, scientists released Phorid flies, imported from Brazil and Argentina, that lay eggs inside the fire ants. Their larvae eat the ant from the inside, and eventually pop out at the joint of the thorax and the head, decapitating the ant—and the new fly goes on to repeat the process. National Geographic didn’t call the Northern Snakehead “Fishzilla” for nothing: This species, native to China, can grow up to 40 inches long, has rows of slender, villiform teeth, and can breathe air—and, therefore, migrate over land. They have no predators outside their native habitat. The Northern Snakehead was first discovered in the U.S. in a pond in Maryland in 2002, where a man had released a pair of fish he had bought from a market in New York. The so-called starry sky beetle might look pretty, but it’s also pretty destructive: It bores into both healthy and stressed maples and other hardwoods, weakening and killing the trees. Found in Brooklyn, New York in 1996, where it came in a shipment from Asia, this pest is currently in five states and threatens many others. The beetle also threatens trees in Austria, France, Germany, Italy, and the UK. You’ve seen them: the huge flocks of extremely noisy birds that alight from a tree, all at once, in a huge black cloud. These are European starlings, which were intentionally introduced in 1890 as part of a plan to bring to the United States all birds mentioned in the works of Shakespeare (starlings are mentioned in Henry IV, Part 1). According to Scientific American, the American Acclimatization Society released 100 starlings into Central Park in 1890 and 1891; by the 1950s, they had spread coast to coast. The birds compete with native species and destroy crops at every turn. So thanks for that, American Acclimatization Society!